Organza is a semi-transparent, versatile fabric useful for many types of crafts. Printing on organza with your home printer allows you to create transparent fabric images that can be layered over a background, which can produce complex, artistic effects. Although you can purchase sheets of printable organza from a retailer selling specialized paper, it is easy to make your own printable organza at home. 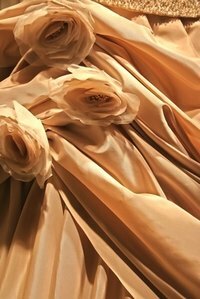 The supplies to make organza paper will likely cost less than if you were to purchase the ready-made product. Lay your organza fabric on the floor. Smooth out any wrinkles, then cut a piece of fabric slightly larger than the label you intend to use. Lay the organza, right side up, onto your cutting mat. Line up the fabric along the measuring guides of the cutting mat. Make sure the fabric is not pulling in any direction and is evenly lined up in every corner. Tear off a piece of masking tape slightly longer than one of the edges of your organza fabric. Lay the masking tape over the edge of the organza. The tape should cover the organza just enough to force it to stick to the cutting mat, with the majority of the tape's surface covering the cutting mat. Repeat this step for the other three edges of the organza. Peel the backing away from the label. Center the label over the taped-down organza, and press the sticky side down onto the fabric. Press firmly down on the label to make sure it evenly adheres to the fabric. Remove the masking tape from the organza. Lift the fabric from the cutting mat, then turn the organza fabric face up and press down onto the fabric to remove any air bubbles. Insert the organza paper into your printer. Make sure the image you would like to print is slightly smaller than the size of your organza. Print the image as you would any other type of paper. You can continue to reuse the sticky labels about eight to 10 times for more organza prints. Try purchasing organza in different colors for variation. Sheet labels can be purchased at most office supply stores.